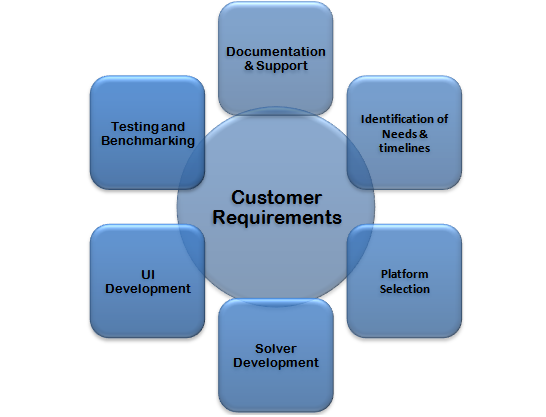 Tridiagonal follows AGILE methodology for all the software development work. All required peripherals are developed keeping customer requirements at the focal point. CFD solvers often need customization to incorporate additional physics. Commercial codes like Ansys-FLUENT provide capability to write user defined functions and coupled them with the solver. Whereas, open source platforms like, OpenFOAM allows the users to develop their own solvers. In either case, the onus to create a robust software lies with the user. All our codes have been extensively validated over range of applications with published literature as well as by comparison with other commercial solvers/ experimental observations. The deployment supports local serial execution on desktop/laptops as well as parallel simulations on HPC environment. CFD methodologies are complex and do need some hand holding. The need is felt strongly in case of open source platforms. Lots of syntax, new terminology and non availability of quality training material makes it hard for any beginner to perform at professional level.